Alex Thibault, the Toronto-based general manager for Vulog North America says mobility providers will need to adapt to a quickly evolving market place and integrate related services with their applications. LOS ANGELES – Vulog, which bills itself as the leading provider of white-label car-sharing technology, is opening its platform to outsiders to meet what it sees as explosive demand for shared mobility services. Alex Thibault, the Toronto-based general manager for North America, announced at AutomobilityLA – the tech conference held in conjunction with the Los Angeles Auto Show, which just ended Dec. 10 – that mobility providers will need to adapt to a quickly evolving market place and integrate related services with their applications. Vulog launched in France about a decade ago. Thibault said it now provides the technology platform for smartphone-based car-sharing services for 25 partners on four continents providing 10 million trips per year. Its Canadian clients include Evo in Vancouver and Montreal’s Communauto. Demand for mobility services is expanding faster than new players can enter the market. Thibault cited a 2016 study by consulting firm McKinsey and Co. that forecast the market for shared-mobility services, currently about US$54 billion, could grow to more than US$1.7 trillion by 2030. “What’s really interesting is we really don’t have enough operators in the marketplace right now to serve all of these US$1.5 trillion,” he said. Vulog provides the technology that operators can brand for themselves but has found they don’t want to be locked into one service provider’s technology forever as the market and consumer habits change. “These things are not one size fits all,” he said. 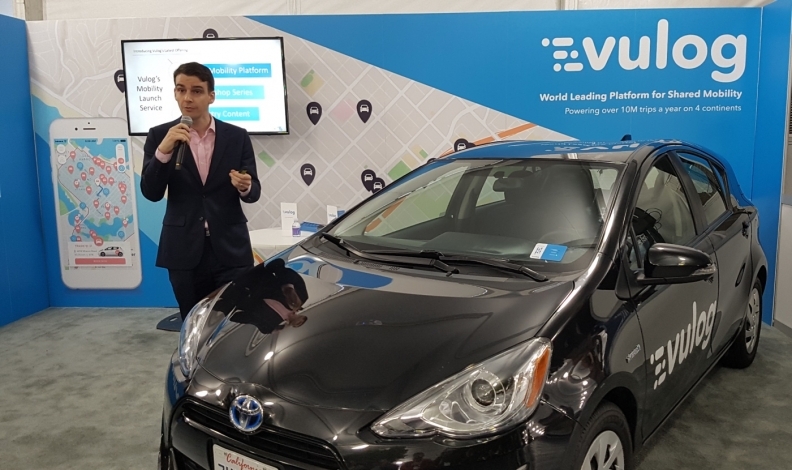 Opening its platform allows Vulog clients, whether it’s automotive OEMs, rental agencies or anyone else, to adapt to market shifts and also seamlessly integrate other applications, such as parking apps to facilitate payment, said Thibault. “This means that operators are going to be able to mix and match between the various things that they want to offer their consumers,” he said. Thibault told Automotive News Canada no one can forecast how shared-mobility services will evolve but partnerships are the way forward rather than forcing operators to chose one platform over another. “The reality is by offering an open platform we can power these things and we can also leverage best practices that other companies have developed,” the Montreal native said. Vulog also plans to organize business workshops and make business-related content available, Thibault said.